Our local hero, Frank, a naturalised Yorkshireman born on the south coast of Yorkshire in Portsmouth, on reeds, leads a line-up of local worthies including Greg Wadman on trumpet, Jim Wright on banjo/guitar, Phil Kampen on bass and Terry Binns on drums. This is Dixie Jazz plus with the emphasis on fun with their own brand of swing music, featuring some of the greatest jazz favourites. They entertain everywhere they go with a good sing-along or two. 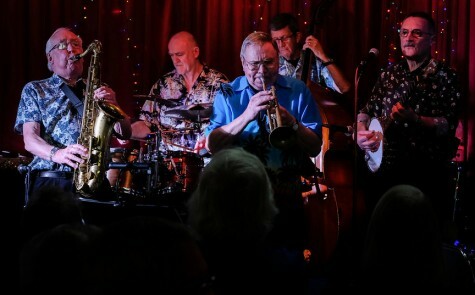 Frank Brooker’s Happy Chappies is one of the favourite bands on the Jazz Club circuit and we are indeed fortunate to have them at the Cross Keys. Traditional Jazz every Thursday afternoon, 1.00pm – 3.30pm, Cross Keys pub, 32 Tadcaster Road, York YO24 1LQ, Tel 01904 700854 with local musicians; food available (a special jazz menu), free admission, free parking (register your car at the bar). The pub is dog friendly and child friendly.